What triggers inspiration these days? Innovation, technology, sustainability, storytelling, and unorthodox collaborations all wrapped up in a pretty bow called experience. This month we excite you with a sneak peak of the 2015/2016 Heimtextil trends and the London Design Festival, we introduce you to unique musical textiles, and we take you through three exceptional boutiques, finally serving you dessert in a secret location on ceramics that will have you coming back for seconds! Get inspired with the September edition! Frankfurt — The word ‘experience’ is plastered everywhere from the Financial Times to the halls of Ambiente and the Heimtextil 2015/2016 trend book. Buying and selling goods and services is all about this uber trendy buzzword today. An experience is multisensory; it involves a mingling of the senses, which explains why aromatherapy and spa treatments, music, food, and drinks make their way into the design scene. Learn more here. Frankfurt — Regular visitors to Heimtextil in Frankfurt each January may have noticed that as the fair has been moving towards the higher numbered halls (such as all of the artists in hall 1.0 who have moved to hall 4.2), the Trend Forum area has become more of a destination than an integrated part of the exhibition. As we all know the trend forum is a key element to the design forwardness of Heimtextil. Messe Frankfurt recognizing this has made a rather large shift for Heimtextil 2015. Its Trend Table has chosen to reposition the Trend Forum in hall 4.0 within what is now called the Heimtextil Theme Park. 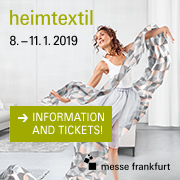 Frankfurt — On September 1st Heimtextil unveils its trend directions for 2015/2016 to be presented next January in Frankfurt. The Heimtextil Theme Park is all about Experience with the aim to promote and drive innovation as well as to stimulate the future of textile manufacturing. Within the very rich text of the trend book four textile trends are revealed. Frankfurt — “Fed up with consumerism and left feeling empty by social media relationships that don’t fulfill, consumers now wish to prioritize personal fulfillment and well-being. A good look around reveals that all the basic ingredients for happiness are there, in objects we feel an emotional connection to; we just need to identify them and place them in full focus,” the Trend Tables teaches us. Milan / London — In our recent Trendease expeditions to uncover great innovation, talent, and inspirations around the world, this is what we have discovered. We all have experiences and emotions that we can connect to music; Nadia-Anne is able to bring them into a tangible realm where we can incorporate the sentimental pieces into our homes and fashions. It is very exciting to have her interpretation of music into textiles as part of the Innovation Platform we are curating for MoOD in Brussels later this month. This truly is experiential design at its finest! 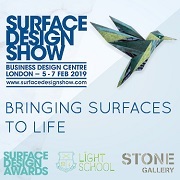 London — For the last six years, each September, the area with a dense amount of showrooms, galleries, pop ups, and retailers has come to be known as the Shoreditch Design Triangle during the London Design Festival. Just on the edge of the triangle rests a quiet, picturesque street worth a stroll. It is here that inspiration awaits you; we will whet your appetite starting with Charlene Mullen. Charlene is a talented creative trained in the art of illustration and print. 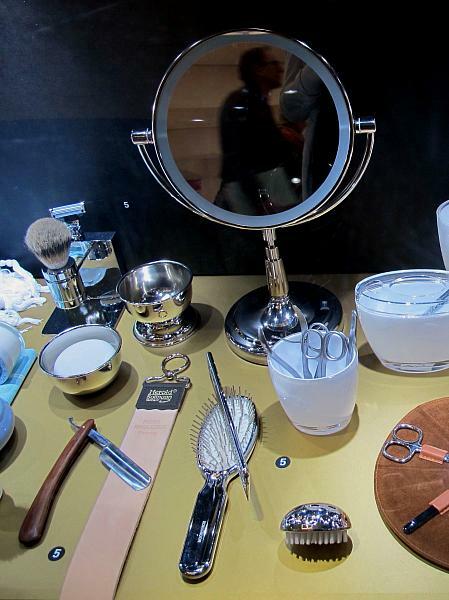 London — Perhaps it is just us, but men always seem so difficult to shop for and to find gifts that we women won’t regret purchasing. Classy, yet manly. You want him to smell good, to look good, and to live in something that does not resemble a bachelor’s pad screaming for a clean. Ladies and gentlemen, we have uncovered a retail experience that accomplishes just this, and you can even enjoy a funkily packaged chilled coffee. If this is your audience, take note! London — The Trendease Team aims to always keep its fingers on the pulse of the new and exciting designs and lifestyle shifts. Sometimes the lines between work and play blur as we strive to regularly attend the hottest and most secretive events around the world. Pop-up art shows, clandestine dinners, interactive theater, these are things we tend to partake in when we are not “working”, but inevitably we often become inspired and some of the best secrets make it to the virtual pages of Trendease. Multiple European Cities — For some readers this gallery may repulse you, for others it may simply represent a visualization of what we know of life, death, and the emotions surrounding the two. In the past Trendease has reported on diamond rings and even textiles made from the remains of loved ones. Folklore and morbid fascinations are not limited to human relations, but also extend to the greater animal kingdom. Throughout our travels it is clear to see that more designers are exploring these concepts. Paris — ‘Secret Gardens’ is a trend forum by Elizabeth Leriche showcasing the skilled craftsmanship from the members of the Atelier d’Art de France with inspiration stemming from raw materials, precise gestures, and pure shapes. The Secret Gardens are communicated in four purposely-built sheds: The High-Perched Shed, The Sanctum of Dreams, Faraway Heavens, and Urban Module. Frankfurt — As the fall trade show season starts to wind down Trendease is here to get you ready for next year’s shows in advance. We are delighted to bring you a sneak peek of the four trend directions presented by Stilbüro bora.herke.palmisano that will be merchandised in February 2015 during Ambiente in Frankfurt under the theme of ‘Sehnsucht’.